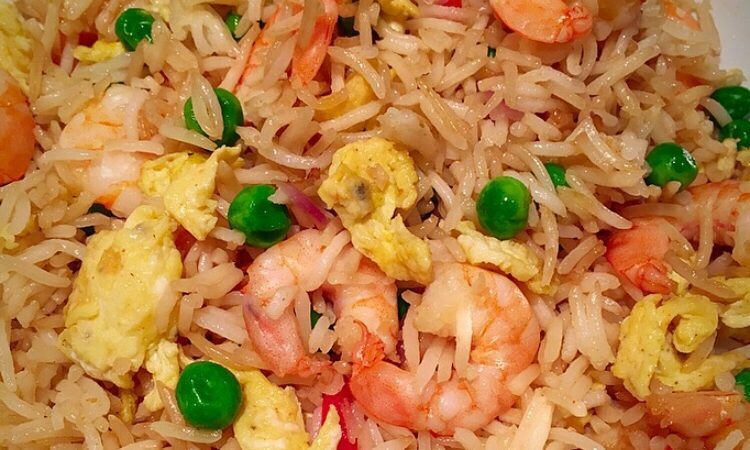 King prawn friend rice used to be a staple in my take away orders, so much so that I HAD to learn how to make it at home as we all know that homemade food is always best for our health and our bank. This recipe took me a while to get right, I just couldn’t get the right textures and after scouring the web I found out why: I was using fresh rice. Every website said to use left over rice but I barely have any leftover white rice, as we tend to use either brown or a basmati and wild rice mix, so I decided to try it with microwave rice. It worked and now I always have a packet of microwaveable brown rice at home just for this. Heat up a tablespoon of olive oil in a wok. Start by flash frying your prawns in a wok until they are completely pink, put them into a bowl and set aside. Beat your eggs with salt and pepper and scramble them, set aside with the prawns. Add another spoon of olive oil to your wok. Take your lemongrass stem and crush it with the flat of a knife or a spoon. Add it to the wok with the onions and crushed garlic. Let them cook for a few minutes then add in your rice, stir it a few times and let fry for 1-2 minutes. Add in your prawns, eggs and peas. Stir and add 2 tablespoons of soy sauce ( you can add more or less depending on your taste). Stir and add salt, pepper and chilli flakes. Stir and cook for a further 1 minute and it’s ready.